OShine Flameless LED Candles, a 3-piece pillar candle set, gives you all the look, feel and style of a beautiful wax candle, but without all the mess or heavy scents. Creating a warm, relaxing ambiance for a bedroom, living space, each set contains three unique sizes, including a 4", 5" and 6" candle. The perfect near hands-free solution for enjoying candles, these flameless, flicking electric candles are battery powered so you can use them over and over. What's more, they come with a 10-key remote that lets you fine tune your perfect light output; and it won't melt, burn or drip like a traditional candle! Click 'Add to Cart' above to get these 3-pack of elegant flameless candles perfect for your living room, bathroom, or as premium home décor. Authentic Style Flickering Light - Add calming ambiance to any room in your house with an LED candle with dancing flame. It offers a flicker so realistic people can't tell! Multiple Sizes per Order - These ivory glowing candles come in 4", 5", and 6" Height (Diameter 3.15") and drafted with real paraffin wax .It makes a great addition to a living space, office, or bedroom. Reusable Battery Powered and Last 300+ Hours- OShine flameless pillar candles are powered by two AA batteries (not included) .It provide 300+ hours continuous light. And you can reuse them time and again with minimal effort. 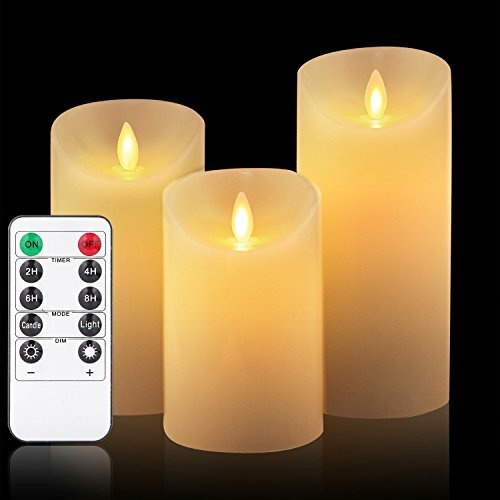 Easy to Use - It comes with a 10-key remote control which has 2/4/6/8 Hour and auto on/off timer(Remote control include one button battery ).It makes a great addition to a living space, office, or bedroom.The candles are made out of real wax,don't use them under the sun or high temperature. 100% Satisfaction Guaranteed - We believe in brand integrity, so if you aren't completely satisfied with our flameless candles once you've received them, please contact us immediately for immediate support. We promise a risk-free purchase. If you have any questions about this product by OShine, contact us by completing and submitting the form below. If you are looking for a specif part number, please include it with your message.